Recent survey says that maximum bloggers and webmasters are technically sound professionals.So they choose their hardware and software themselves to continue as bloggers or webmaster.Today I am going to give an review of most discussed hardware launched by the ASUS.ASUS ever the gracious hosts,had us out to Dallas,TX recently to show us the company’s upcoming motherboard series and let us play with some test systems to see if we could break them. (Full disclosure :We did.But we fixed them,we think. )There is much we learned there that we can’t yet discuss(suffice it to say you’ll want to stay tuned for more on Intel's 3rd generation Core series processors and 7-series chipset),but we can tell you all about the new line of ASUS motherboards based on Intel’s Z77 series chipset. ASUS’strategy of late has been simple but effective:start with something that is rock stable and just works,then build on it,and allow for extensive fine-tuning.Thus,these motherboards will share many of the features and functions of recent ASUS offerings while sporting some new enhancements.Here’s a brief overview of some of the ASUS Z77 motherboard features. 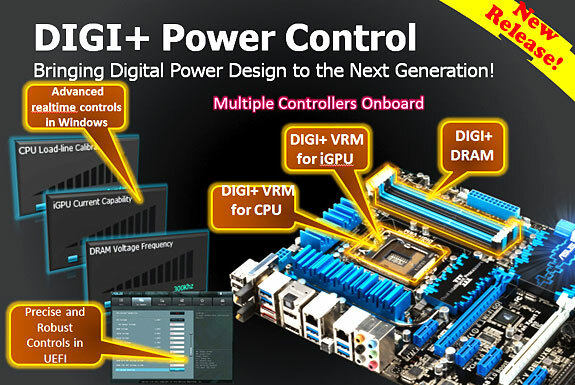 With this 7-series chipset, ASUS is debuting the next generation of their Dual Intelligent Processor with SMART DIGI+ Power Control across its entire lineup. The new features expand on Dual Intelligent Processor by including all-digital controls for more than just the CPU and memory,as well as real-time controls. 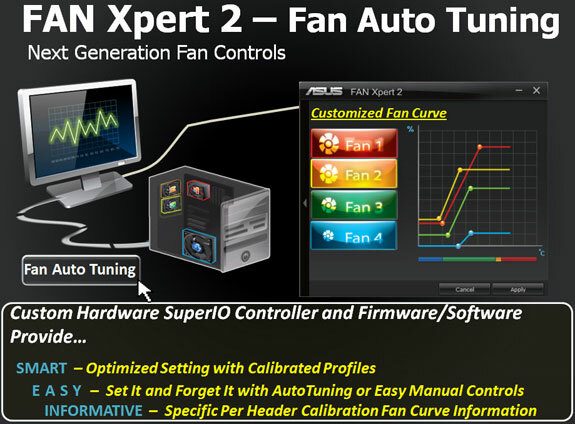 Further,although Fan Xpert gives users incredibly precise control over fan speeds,Fan Expert II takes it to a new level.Fan Xpert II can detect all the fans connected to the board and optimize the speed for all of them.Then,the user can adjust each one,renaming them and setting custom configurations.The tool also has three presets built in--Silent,Standard,and Turbo--for an easy,automatic configuration. ASUS Wi-Fi GO! 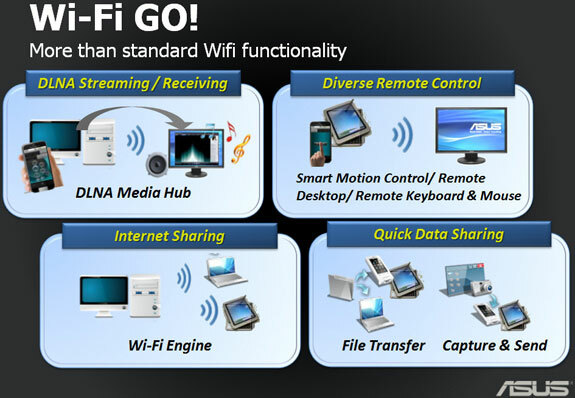 is an interesting new feature; all the new boards will have 802.11n WiFi built in.Wi-Fi GO! facilitates bi-directional DLNA streaming,Internet sharing across multiple devices,swapping data between devices,and even remote control capabilities with a connected mobile device. Finally,the motherboard's on board LAN interface features Network iControl,which lets you manage packet priority,traffic shaping,and bandwidth.The lineup will also include features you already know,such as USB 3.0 Boost,USB BIOS Flashback,USB Charger+(which now works on all standard USB 2.0 devices instead of Apple devices only),ASUS SSD Caching,DTS Ultra PC II and DTS Connect audio,and tweaks to AI Suite.